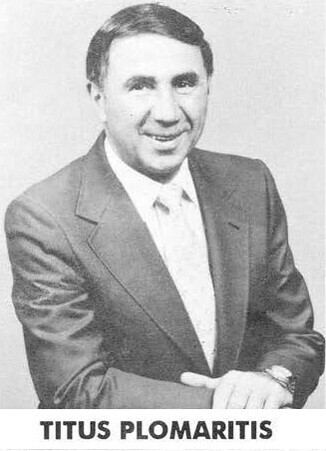 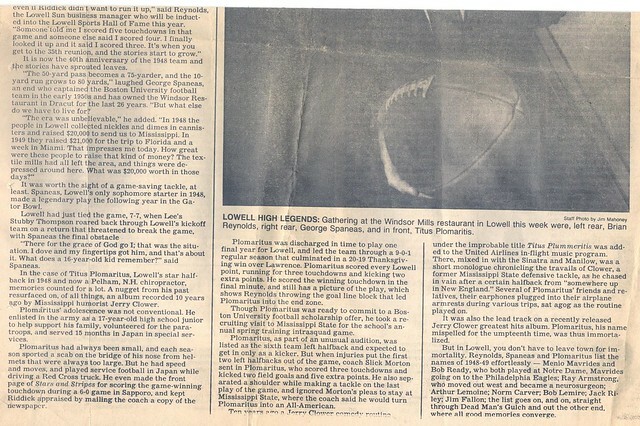 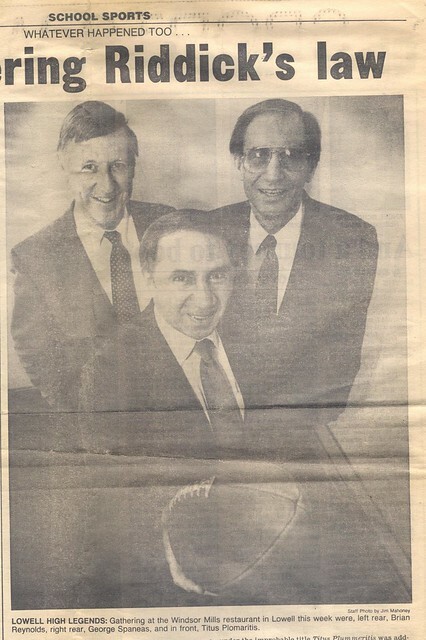 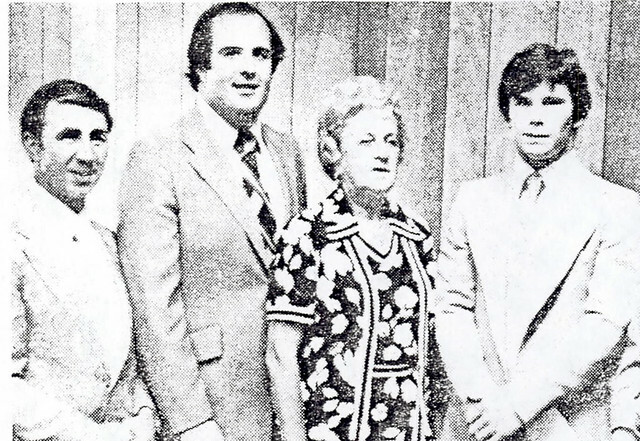 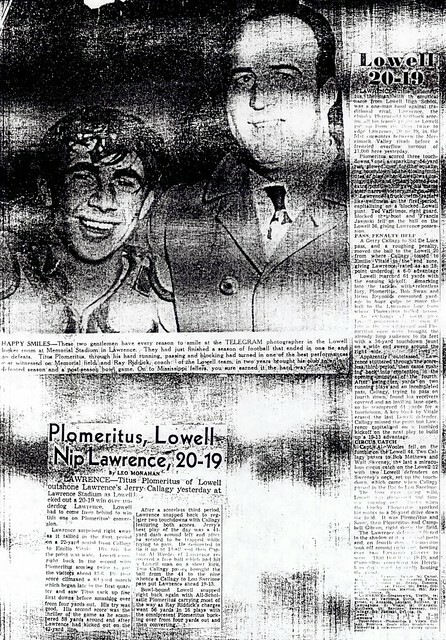 Renowned for one of the greatest single game performances in the storied history of the traditional Lowell-Lawrence football series, Titus Plomaritis etched a permanent place for himself in the annals of the Red & Gray Football Program. 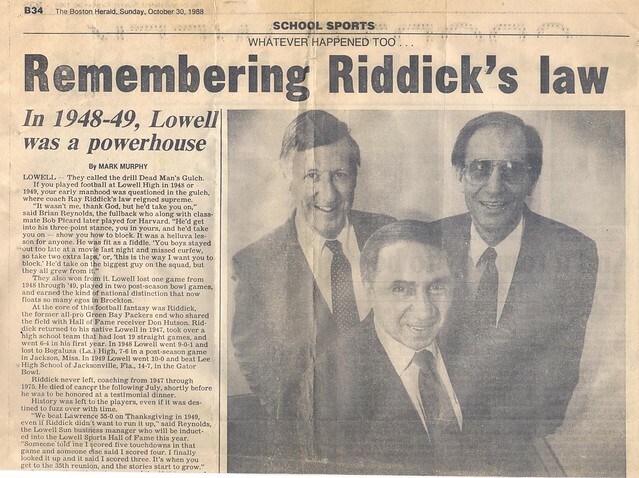 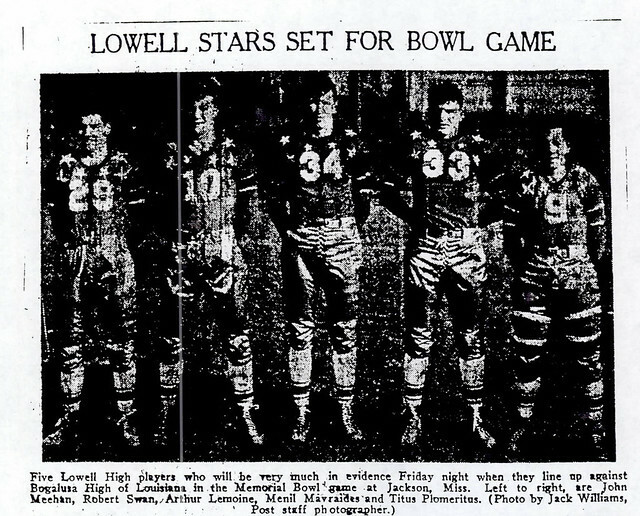 A three-year varsity performer for Lowell, Titus’s senior year saw the dawn of the Ray Riddick era at Lowell High. 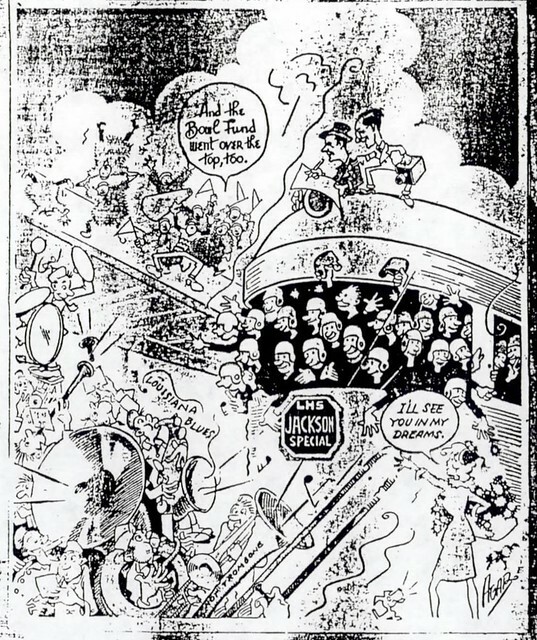 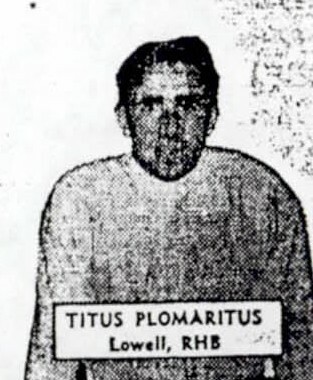 Titus was one of the key performers. 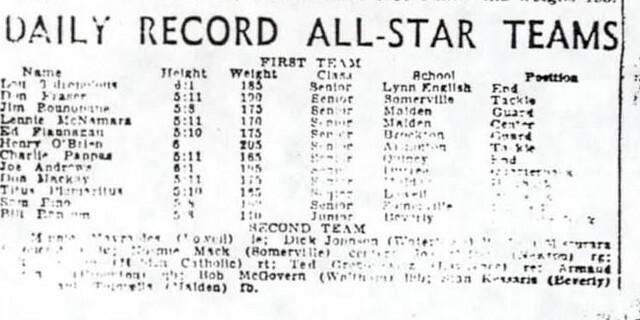 As the all-purpose standout, he led the Raiders and Eastern Mass Class A in scoring with 80 points. 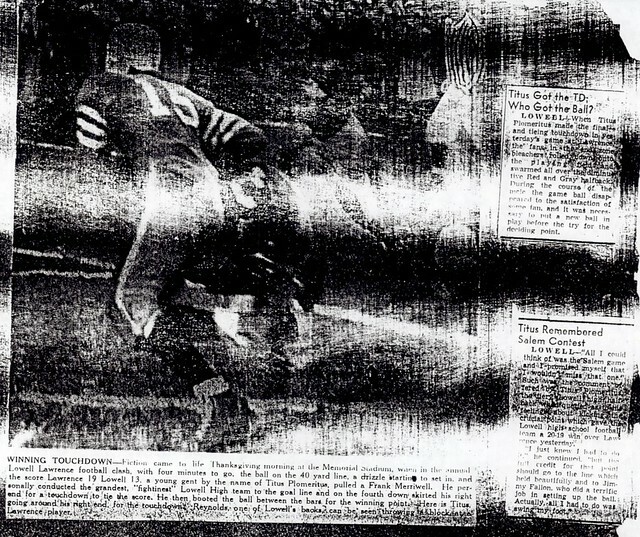 As well as being a standout halfback, Titus was a superior place kicker, totaling 23 PATs and 1 field goal. 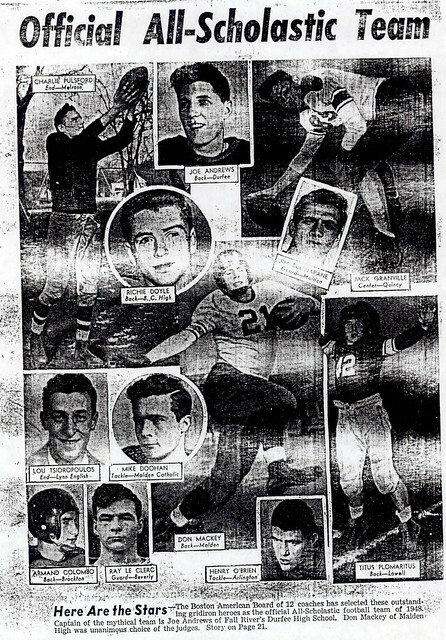 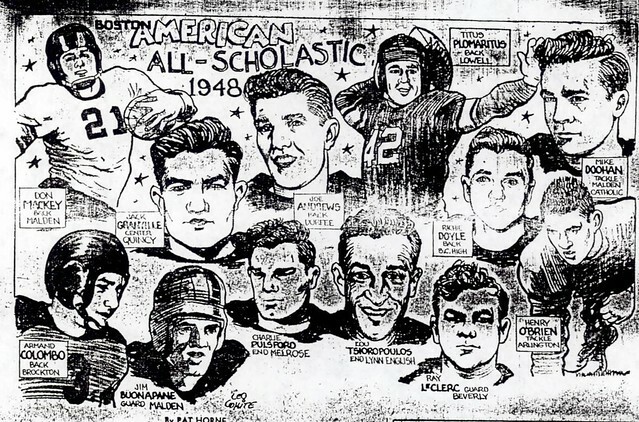 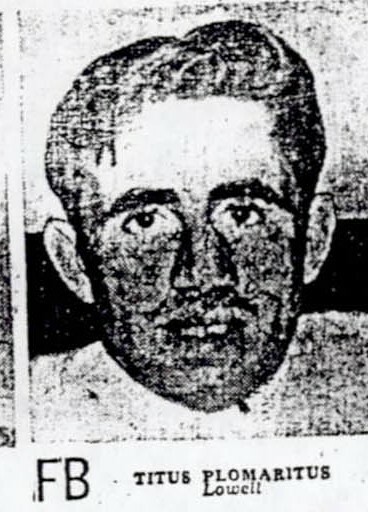 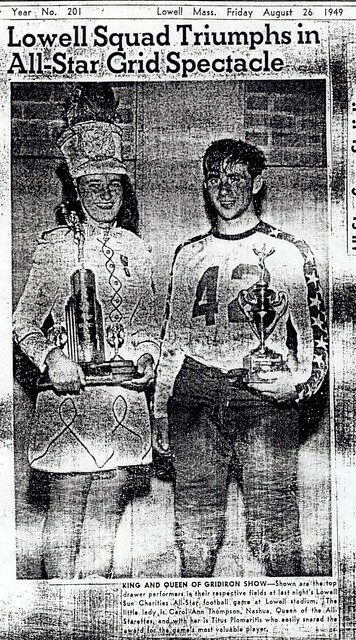 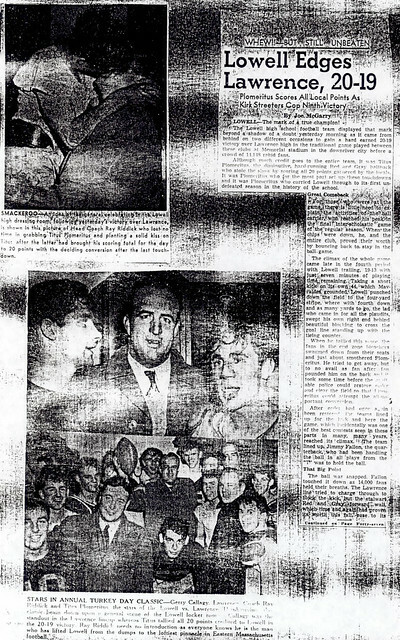 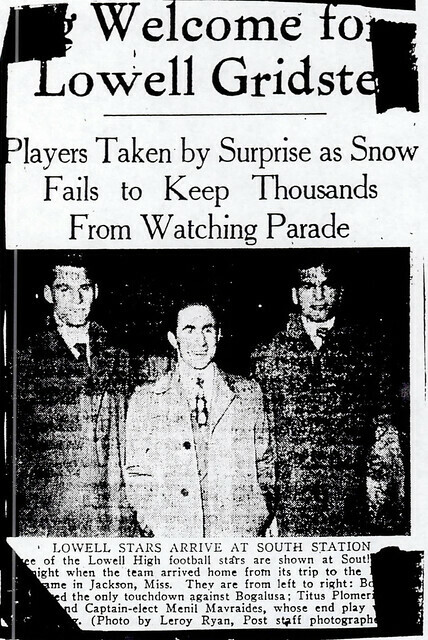 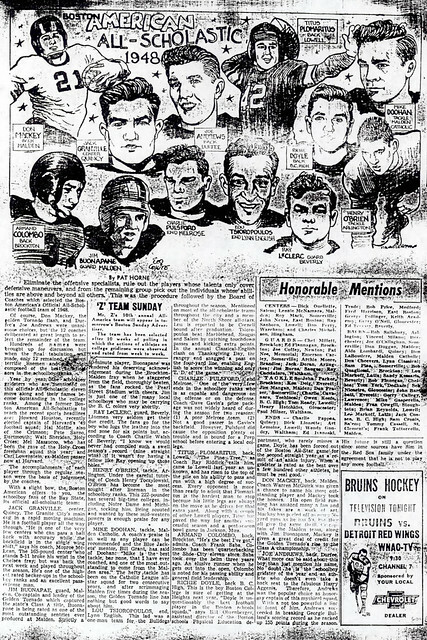 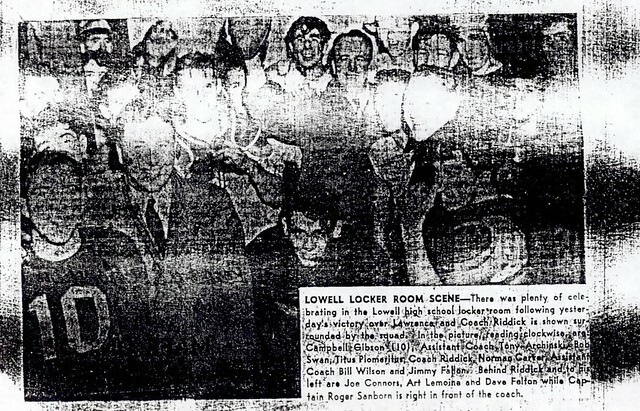 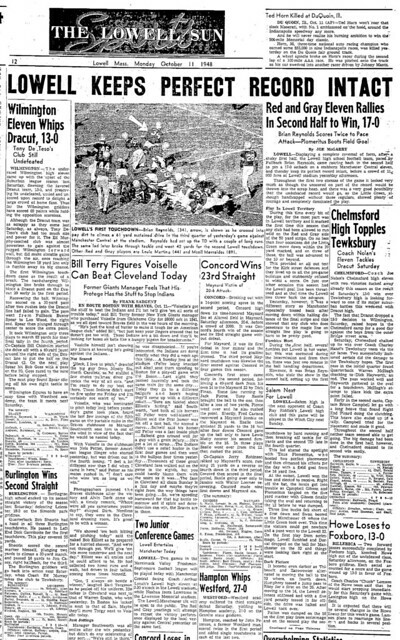 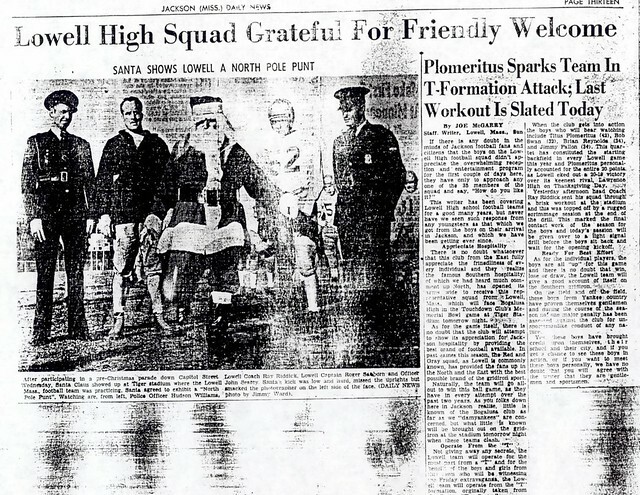 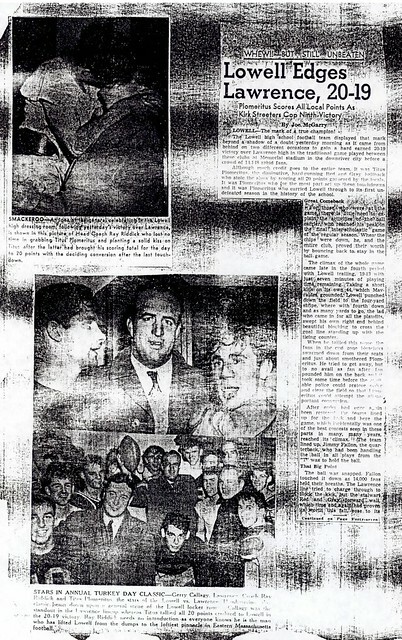 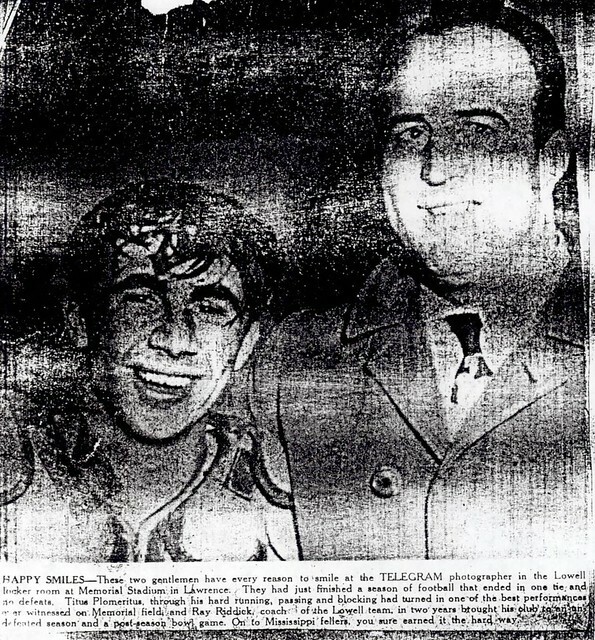 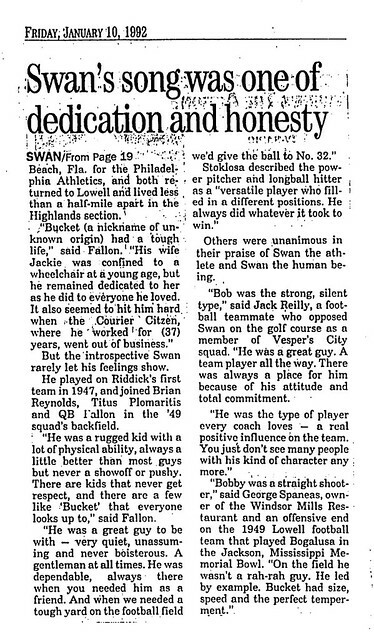 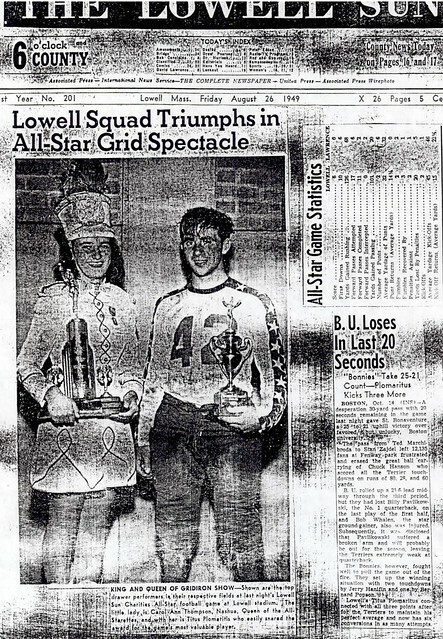 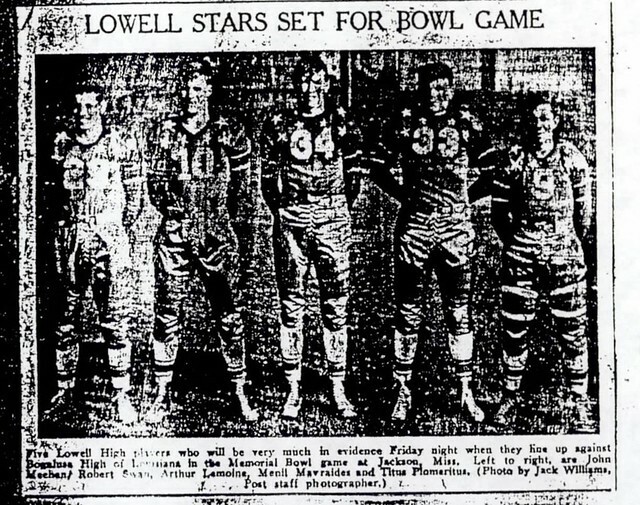 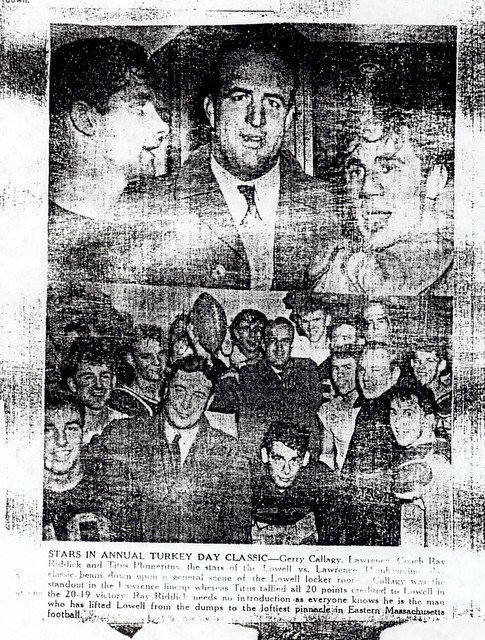 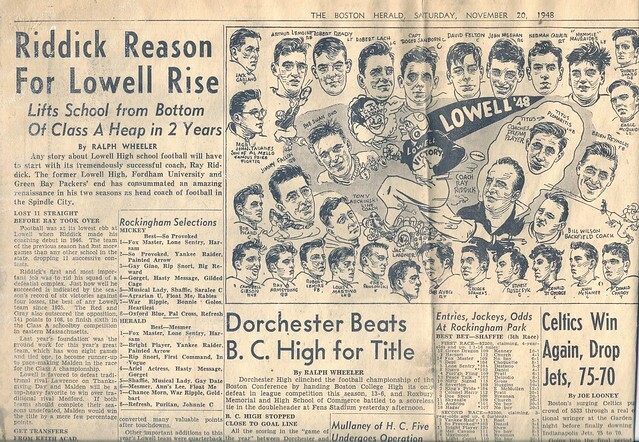 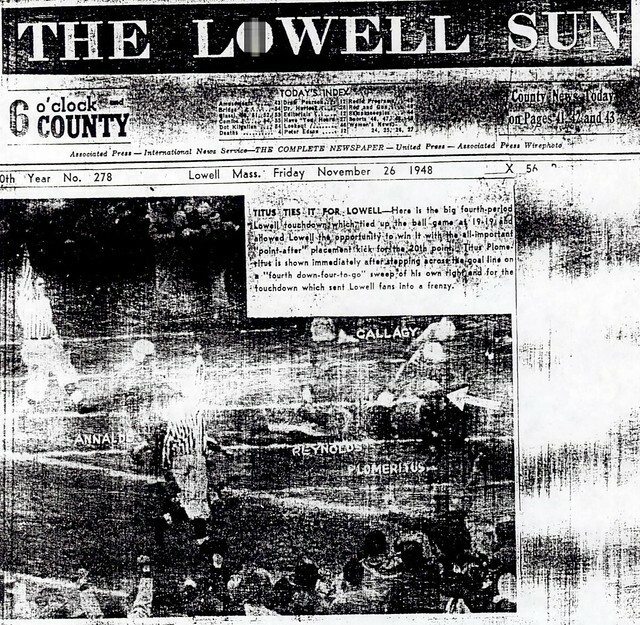 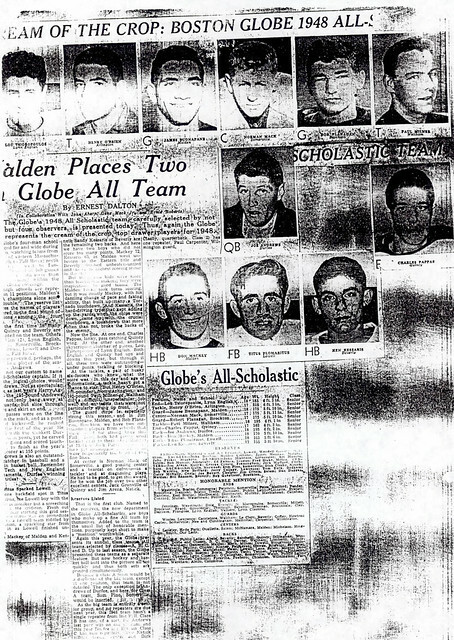 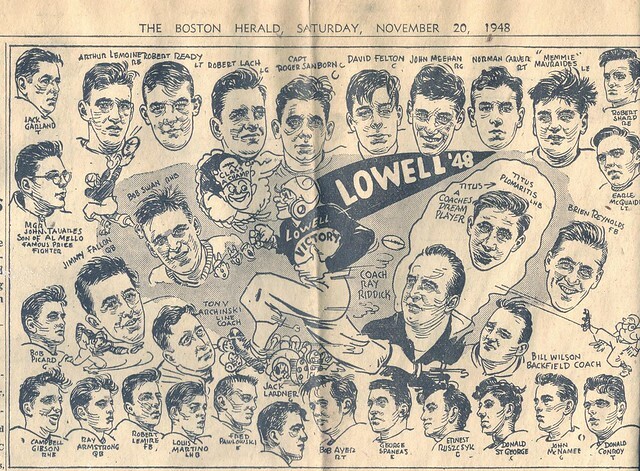 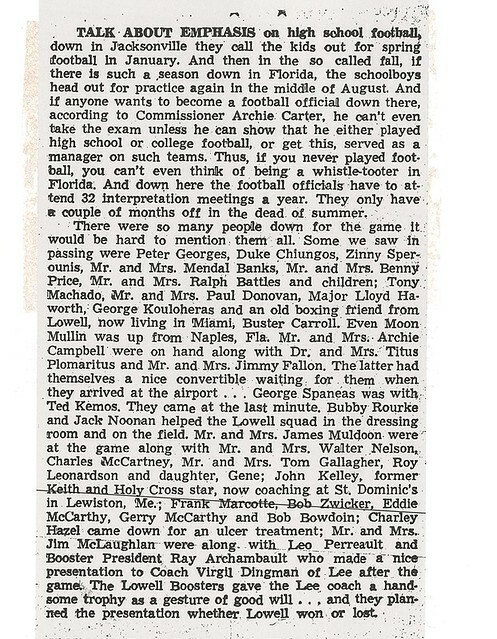 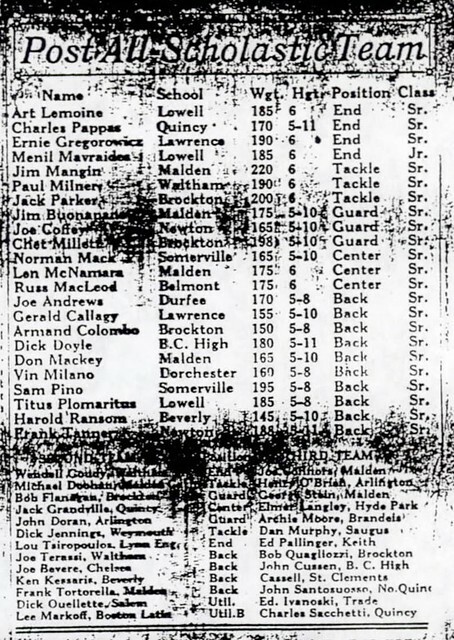 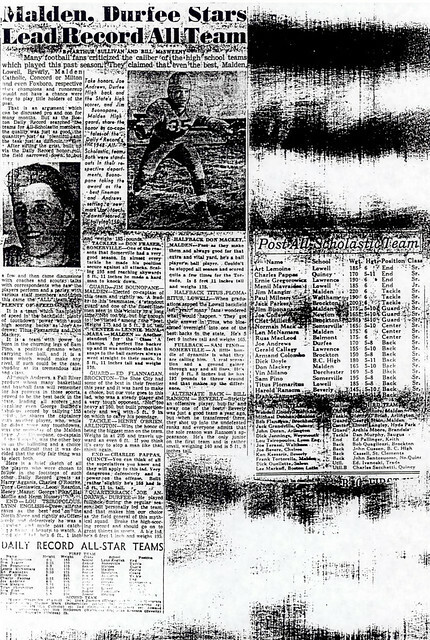 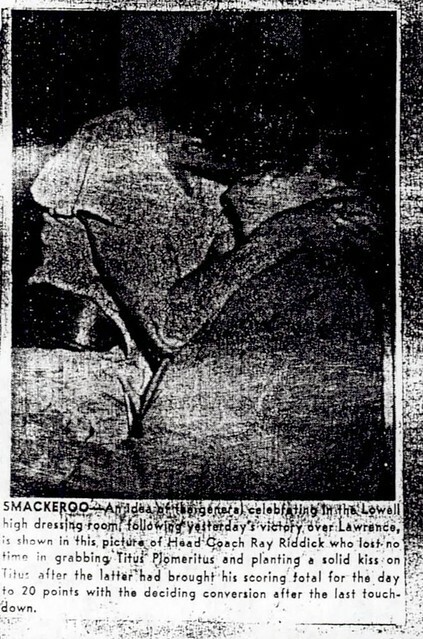 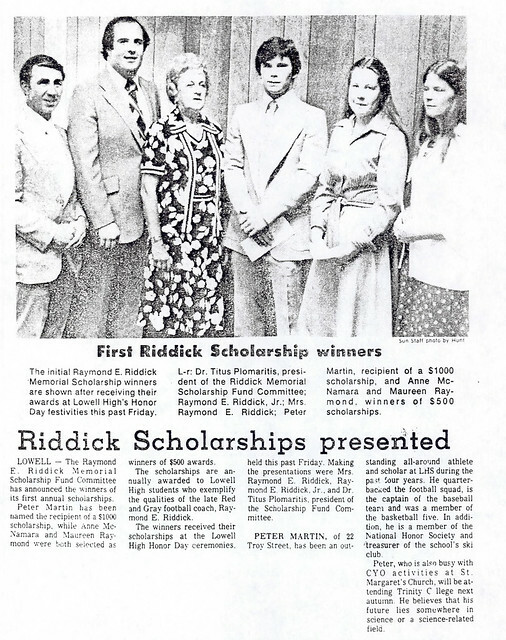 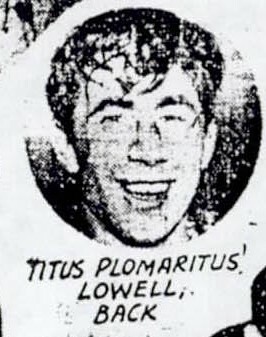 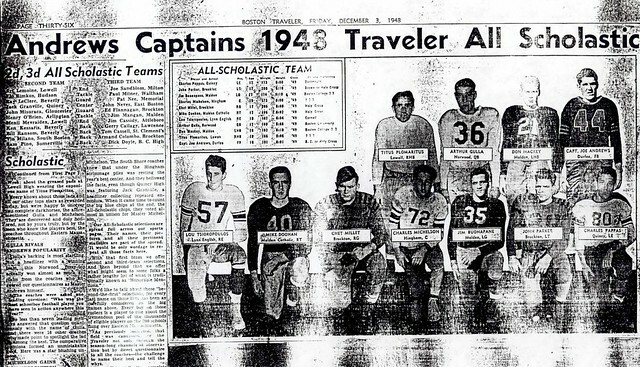 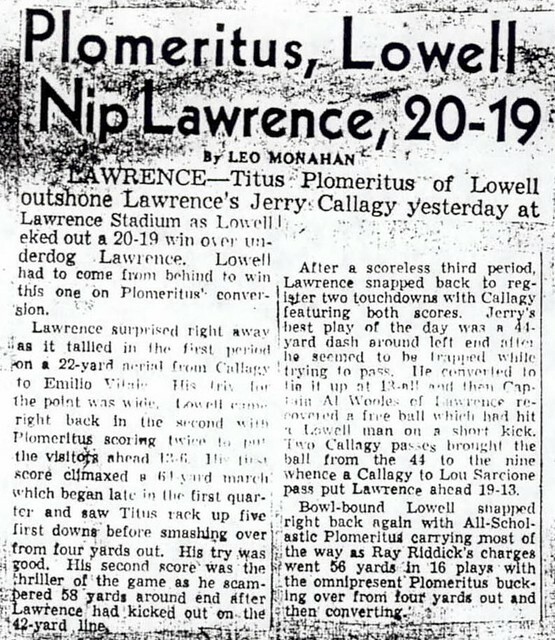 It was at the Lowell-Lawrence game of 1948 that the “Plomaritis Legend” was born. 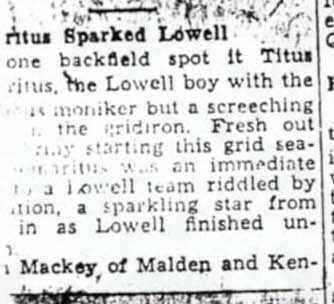 With a series of dazzling runs and kicks, Titus led the underdog Red & Gray, scoring all 20 Lowell points, including the game-tying TD and winning PAT with but 4 seconds remaining. 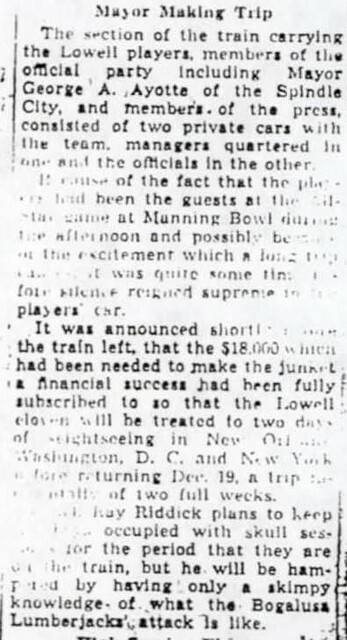 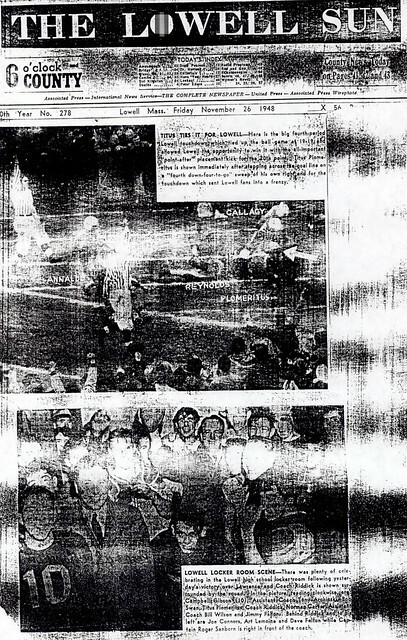 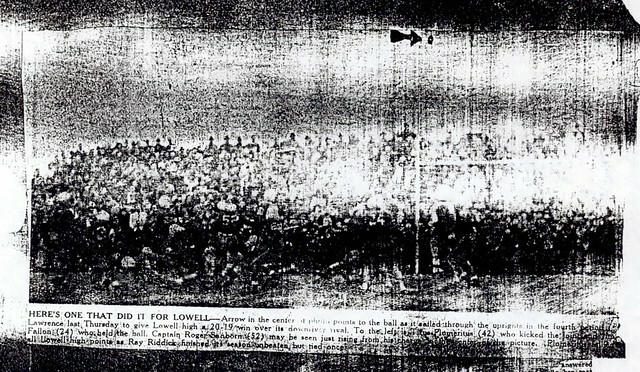 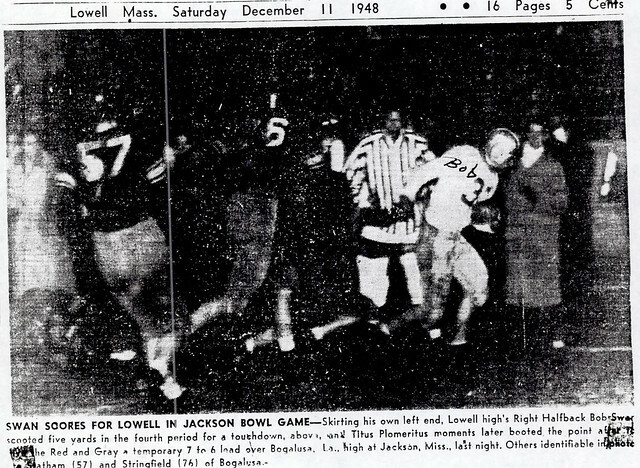 The 20–19 victory concluded Lowell’s first-ever undefeated grid squad and insured its first-ever bowl appearance in Jackson, Mississippi. 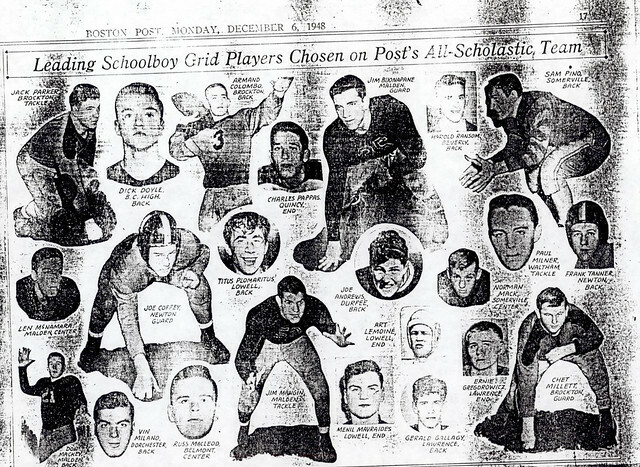 Titus was a consensus All-Scholastic selection during this outstanding season. 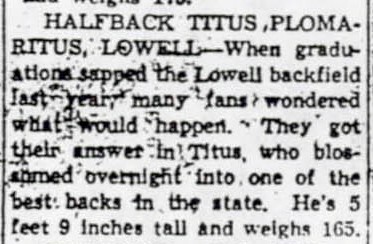 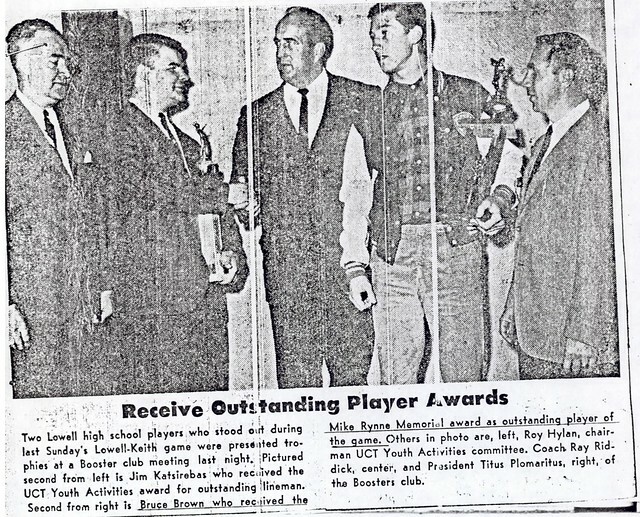 Titus attended Boston University on a football scholarship. 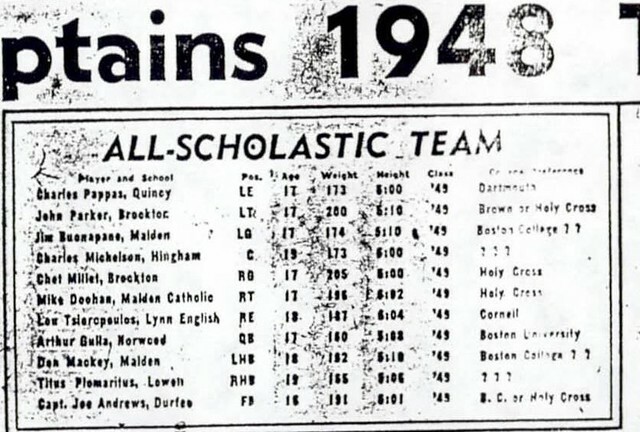 During his tenure as a Terrier, he was a Two-Way starter and frequently played the entire game because of his versatility as a kicker and kick returner.